Kleijn Nurseries and Garden Centre is please to announced our 2017 Fruit Tree Selection, available starting in November 2016.
all others will arrive February / March 2016. You can download a PDF version of this list. • Fuji Red Sport* : Late October, excellent eating apple, stores well. • Royal Gala : late summer apple. hardy, vigorous tree. firm, red apple. • Red Gravenstein : Firm juicy with tart flavor. • Granny Smith: green apple, ripens late October . • Sunrise : Probably the best summer apple, very productive. Early apple, red. • RedFree* : summer apple. Tree is immune to scab and cedar rust. • Honeycrisp : large round apple, very crisp and juicy. Excellent keeper. • Paula Red : early season eating apples. Small to medium apple, taste is mild. • Cox Orange*: apples are yellow with red blush. thin skin, the firm flesh is very juicy. • Florina* : European scab free, matures mid-october. Red apple. • Liberty* : similar to Spartan, scab and mildew resistant. • Combination apple: Sept ruby, Goodland, Norkent, Honeycrisp. • Combination apple* : Liberty, Redfree, Golden, FLorina. 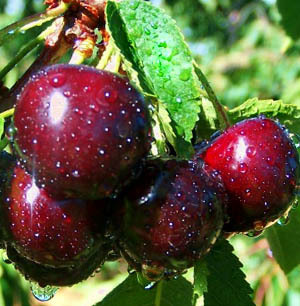 • Crabapple ”Dolgo” : good for jelly, small apples red, crisp and juicy. • Comice * : the sweetest and juiciest of all varieties of pears. • Italian Plum * : dark purple skin, yellow flesh, freestone. • Theta : small to medium size nuts, pollinator for Jefferson. Blight immune.